Terrapins, Turtles and tortoises are very important species, which live long and they belong to genera “Chelonia of Reptiles”. They are harm less and have an important role in this diverse universe. Lot of humans kill them, eat them and predators like rodents, foxes, ants also take their chance in hunting them. 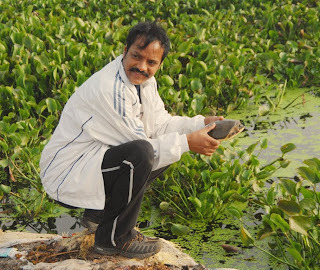 Fresh water terrapins are widely available in this state (Andhra Pradesh of India). They move very fast even on the ground and are great swimmers and also fierce hunters of fish. They eat variety of substances like algae, leaves, fish and small insects. During monsoons they travel a lot and reach ponds and water bodies in search of mating partners. We can see them quite often basking under the sun which is mandatory for cold blooded reptiles. I have saved more than 165 turtles from people and left them in their best environments for survival. 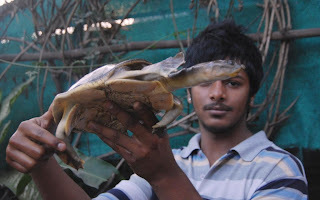 This picture shows the aggressive green terrapin of 22 cm x 28 cm of shell size, which was being chased by street dogs and was rescued by Mr Ashad B Choudhary is none other than my son; later we held the turtle for two days to check for any injuries, and then we left it on 12 Dec 2009 at RK. puram lake near Sainikpuri, Secunderabad, AP,India. The way this terrapin jumped into its natural habitat was amazing to watch. I share with you all and you are most welcome to contact us. Served in Army for 10 yeras; Have done MBBS, MD in Sports medicine; Served many Indian as well as foreign sports teams as team doctor; Discovered 3 new diseases of IT professionals. Conducting Many sports related courses; Doing research with obesity, exercise ergonomics and Nutrtion. Currently Running a Spine Centre to deal with many medical problems.